As UK artists dominate the top spots on the US Billboard album charts, with Adele, Marsha Ambrosius and Mumford & Sons at positions 1,2 & 3 respectively, one of the world’s biggest and most influential music conferences comes to a close in Texas. South By South West, or SXSW as it is more commonly known, attracted over 20,000 people to it’s 25th anniversary event last month, with delegates attending five days of seminars, industry panel sessions, presentations, receptions and the all important showcase performances from a global portfolio of musicians. But despite hundreds of acts vying for attention, the big British buzz continued at SXSW with a spectrum of UK artists making noise on stage and off. London lass Ellie Goulding set the folk fraternity alight, whilst Hackney based rapper Professor Green proved there was life after The Beats, Birmingham born Mike Skinner’s somewhat eponymous, and now defunct, record label. Elsewhere in Austin, York based hard/metalcore quintet Asking Alexandria made a memorable conference debut, but the ultimate guitar heroes were The Vaccines, continuing their meteoric climb up the music industry ladder. 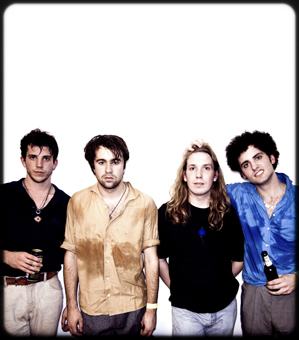 Since signing to Columbia at the end of last year, The Vaccines’ melodic Indie Rock has already been cited as a ‘game changer’ by Clash Magazine, whilst drawing tentative Punk comparisons to The Ramones elsewhere. The London based band released their debut album, ‘What Did You Expect From The Vaccines’, on March 14th, under the watchful eyes of an often divided music industry.